I have yet to hear of a reliable way of watering indoor trees. Asking a friend or neighbour can work but only if they are reliable enough to remember to water properly on a regular basis. Many trees have been lost after neighbours have forgotten to water a tree on just a single occasion while the owner is away on vacation or holiday. 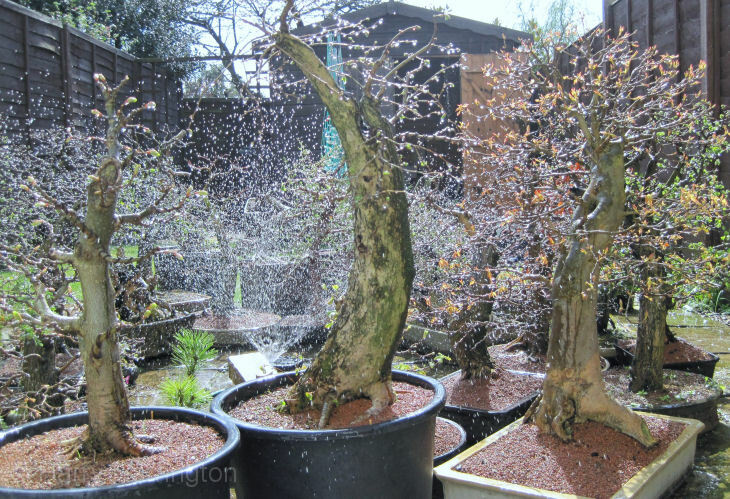 Trying to water trees using a wick is very haphazard and leaving a tree sat in water is unlikely to be good for any bonsai, particularly any that are already weak or in poor health. If an indoor tree has to be kept inside during the period of your holiday (tropical species during the Winter for instance), the amount of water the tree requires daily can be reduced by being moved to a cool position away from light to reduce transpiration and moisture loss. This will increase the amount of time the tree can be left without additional watering, hopefully for the duration of your vacation. If a tree can be defoliated with confidence, do so a week before going away as the moisture needs of the tree can increase greatly in the days immediately after defoliation. It is always far easier to holiday trees outside. 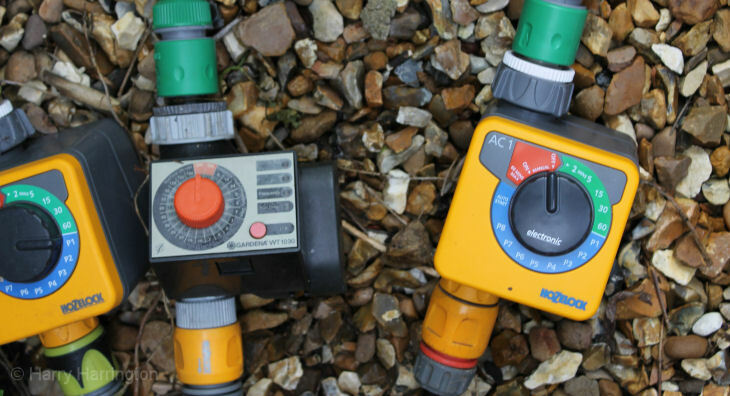 Two basic types of automated water timers; these are fed by a hose coming from an outside tap. When the valve opens at set intervals, the water is able to pass through to the sprinklers and sprayers on the bonsai themselves. For many years I have found that a temporary (or permanent) automated watering system is the most reliable way to keep bonsai watered for extended periods of time. Position all trees out of the wind or direct afternoon sun, both of which can cause excess transpiration and moisture loss, and collect all the trees together in one place (even if a neighbour ends up doing the watering while you are away; having the trees in one area of your property avoids individual trees being missed). Garden sprinklers are positioned around the bonsai and connected to a mains tap via a programmable water timer. The timer contains a valve that at preset times opens the flow of water into the hose/sprinklers, watering your bonsai. Water Timers can be preset to allow watering 1 or more times a day for anything up to ½ hour at a time. Most Water Timers are powered by battery and so are very easy to install when needed; no connection to outside mains electricity is necessary. 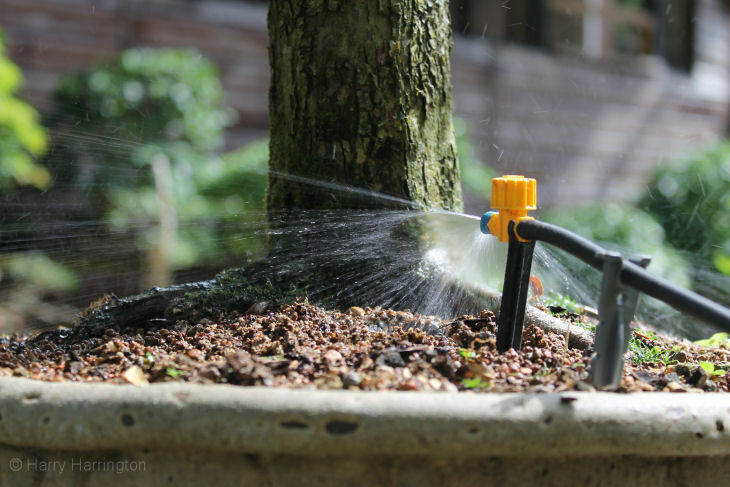 Set the timer so that the trees are thoroughly watered and ensure that underwatering will be completely avoided. 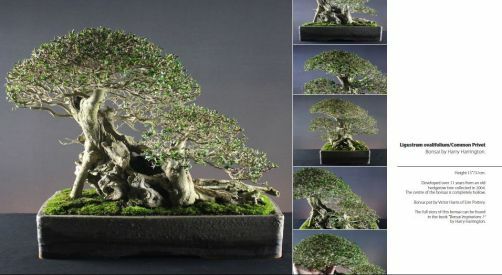 Any period of underwatering (the soil drying out) may cause irreversible damage and loss of the bonsai. When presetting the frequency and duration of watering, don't rely on weather forecasts to try and prejudge the water needs of your trees. Always assume rainfall will be zero and temperatures above average for the time of year. Few garden sprinklers will give out a even spread of water. There will be areas that receive more water than others; try to use these for particularly thirsty trees. It is always a good idea to set up the sprinklers for at least a few days before leaving for your vacation to ensure that all trees receive sufficient water each day. As a short term solution, this system is the most reliable way I have found of ensuring your bonsai will survive while you are away from home. 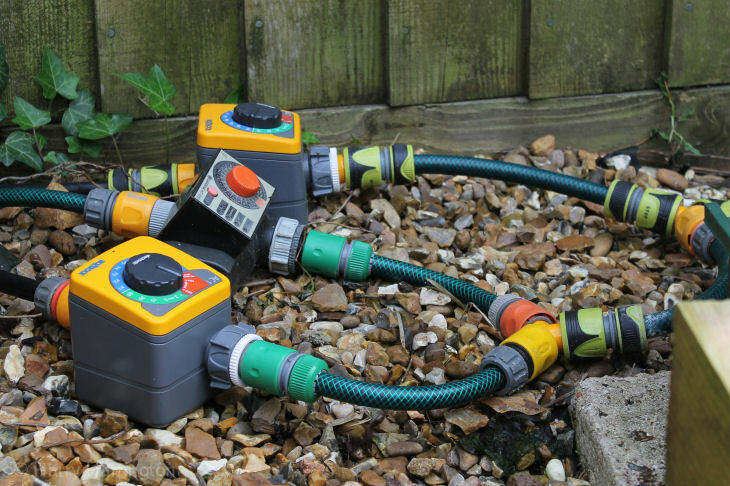 My permanent watering system now consists of three water timers; there is insufficient water-pressure in my garden to supply all the sprinklers and sprayers at one time. And so, the system is split into 3 sections, each of which waters a different part of my bonsai collection at a time. In recent years I have installed a permanent watering system for my bonsai collection as the frequency at which I am away from the garden increases. This system works on exactly the same principal as a temporary system, except that I have installed a great number of micro-sprinklers and sprayers around my display benches and monkey poles so that the trees can be left in situ when I am away and the water-timers simply need to be switched on before I leave. While I still water my bonsai by hand when I am at home, the permanent watering system is also useful on hot Summer days where the bonsai can be watered thoroughly for 2-3 minutes at a time using the water-timer. Watering for this prolonged period of time ensures that the soil absorbs the maximum amount of moisture possible and greatly increases the amount of time that passes before watering is required again.